Now that I'm into my 4th year of quilting I am finding myself finishing things much quicker. It's like all of a sudden everything is on the fast setting - cutting, piecing and quilting - all going so fast. The basting not so much - still hate that part. 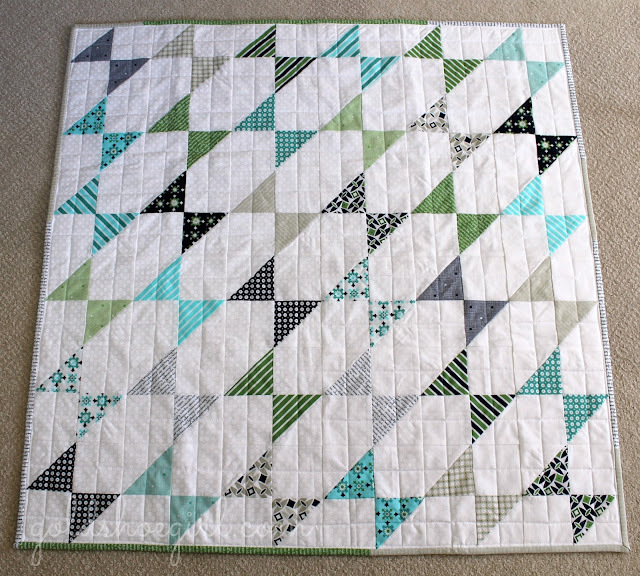 So anyways, I have 2 baby quilts to share from this week. First is this one made from 3 Sisters for Moda's Whitewashed Cottage collection. 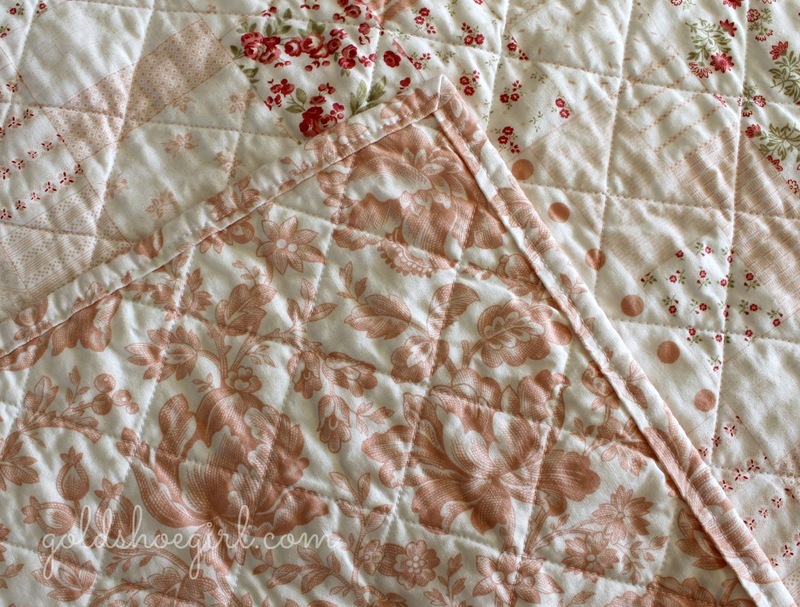 This was made using the cheater print for the front and the pale pink floral for the back. 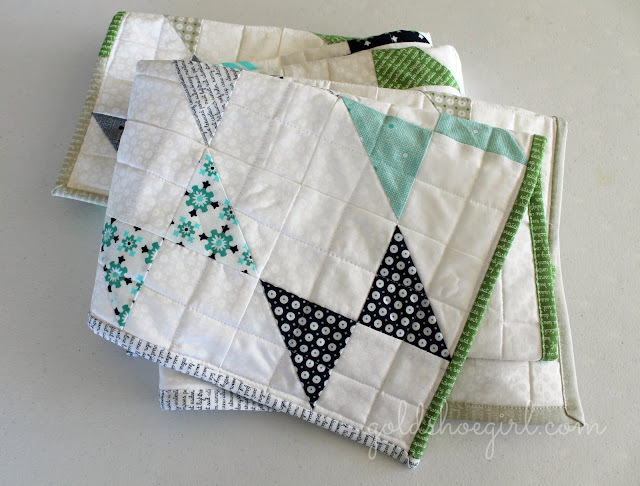 I wanted to point out to any new quilters or sewers that a cheater print like this one makes a great starting project. 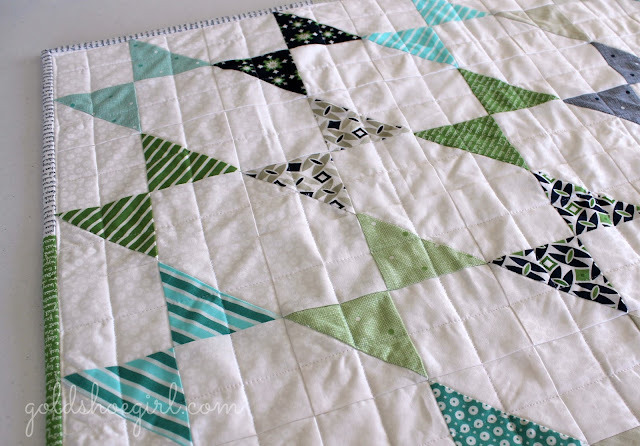 The print looks like a patchwork so all you have to do is put together the cheater, some batting and a backing and quilt away. A cheater print is also great if you need a quick gift since you don't have to do all the fabric choosing, cutting and piecing that normally would go into a quilt. I decided to quilt this in a diamond crosshatch pattern. At first I started quilting around all the faux squares but it became extremely tedious very quickly so I soon deserted that idea and went with the crosshatching instead. The binding is the same print as the backing. My 2nd quilt finished this week is for a baby boy. Or I suppose it could be gender neutral but I think it leans towards boy. I used my Daysail by Bonnie and Camille stash for this one but I choose only the geometrics, stripes, dots and script prints - no florals or anything girly in this one. It's a traditional pattern but the fabrics give it a very modern feel. The background is a tone on tone white - I like the depth it gives versus my usual plain white backgrounds. I also used the same print for the back. I quilted it up and down and side to side across each square. I think it gives it a nice clean line in keeping with the fabrics. The binding is scrappy made from all the different colors of the script print which says all kinds of cute nautical words. 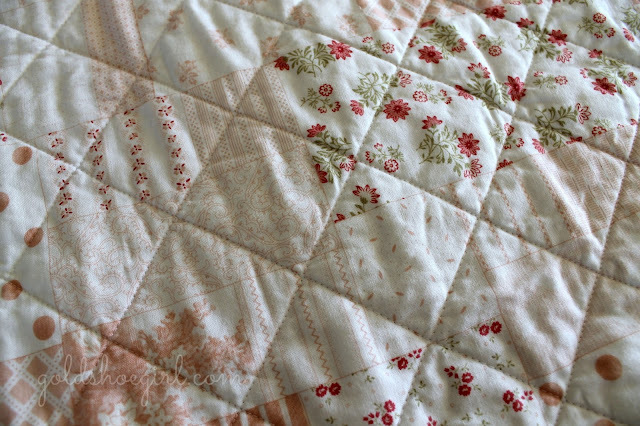 This quilt was also very quick because it was just simple HSTs and then regular squares. I use the non-traditional way of making them so I get 4 at a time. I pieced them together into bowtie blocks and then put together my rows. Easy breezy. Another great beginner quilt. 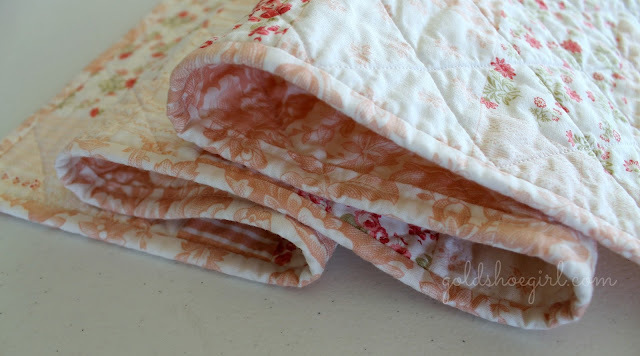 Also, another good beginner tip I wish I had known - keep the width of your baby quilts to less than 40 inches. Most of mine end up between 36 and 40 inches. This way you don't have to piece the back and you can just use a standard yard of fabric for the back. This makes your quilts go a lot faster and easier. 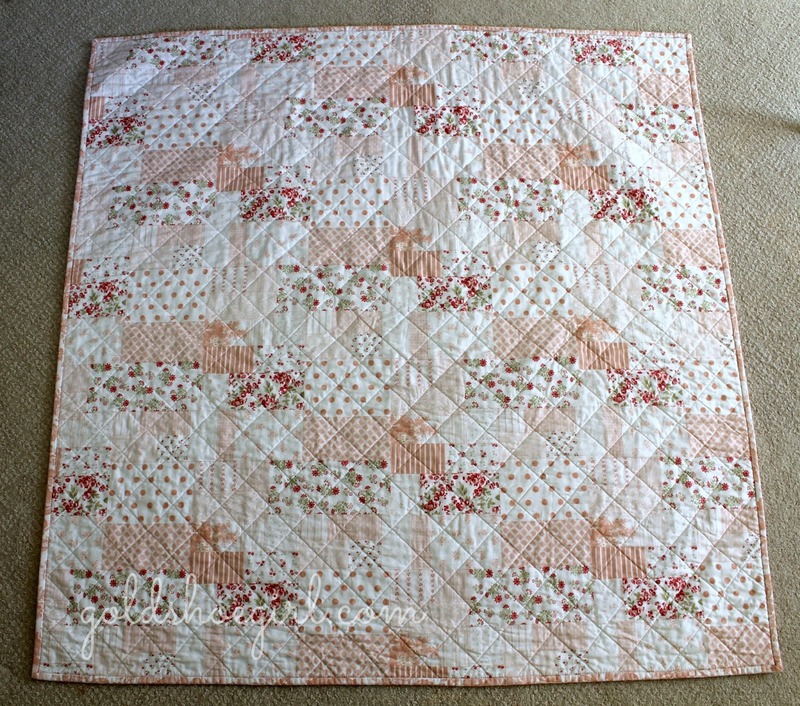 The floral baby girl quilt and the nautical baby boy quilt are both listed in my etsy shop for sale. By the way, if you want to see the things I am working on a daily basis including some behind the scenes pics then be sure to follow me on Instagram too. Great finishes! So simple, fast, and easy. 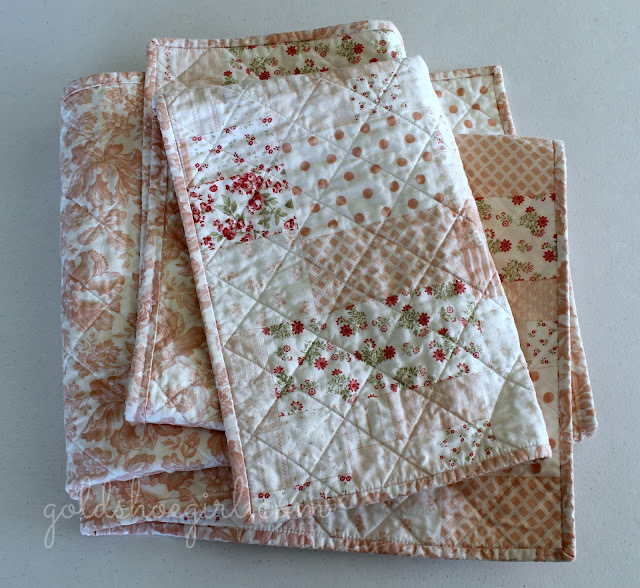 Perfect for baby quilts! Nice post. I'm a day sail fan too. 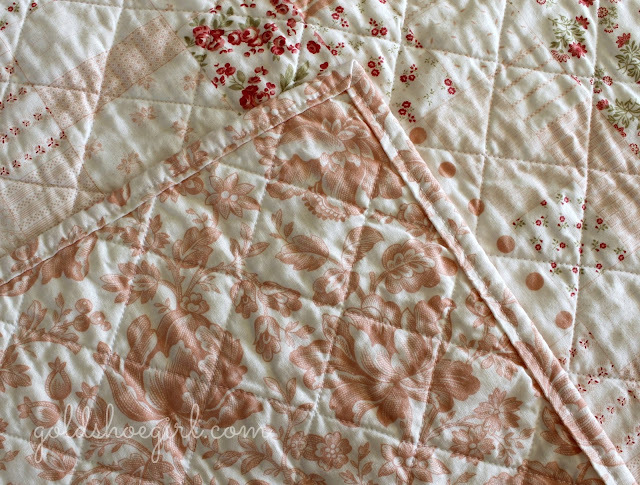 I actually like the "old fashioned" look of the baby girl quilt. Pieced or not, it's lovely. two nice little finishes! i think the bow tie pattern on the blue quilt makes it even more of a boy quilt. so cute! Both are very pretty, nice finishes!